In 2017, Amazon bought Whole Foods and built bookstores and grocery stores. Ecommerce businesses like Sezane, Allbirds, and others all expanded into brick-and-mortar locations. Meanwhile, apps, virtual and augmented reality have blurred the lines between physical and digital retail. And it’s also the era of omnishopping: Criteo’s Shopper Story research found that about 3 out of 4 shoppers engage in online to offline and offline to online shopping. What’s more, Criteo’s Global Commerce Review data shows that for omnichannel retailers in North America, omnichannel shoppers represent 7% of all shoppers, but generate 27% of all sales. But it’s important to note that 82.5% of all retail sales through 2021 will likely still occur in brick-and-mortar stores. What does this mean for marketers? Your offline marketing strategies are still more important than ever, but must cater to today’s omnishoppers. Brands that began online like Allbirds and Everlane are investing heavily in opening more brick-and-mortar locations, and global, long-standing retailers like Sephora are training their sales staff to be more knowledgeable and digitally-savvy. At Allbirds, physical stores are run like restaurants, providing customers an immersive experience that keeps products and sales people in front of customers. “We have a bartender around the inventory; hostesses, bar backs…to create a better experience for shoe buying,” says founder Joey Zwillinger. Even more than store design and interactive experiences, sales reps help create the experience in your retail spaces. If carefully hired and trained, they can turn one-time buyers into repeat, loyal customers. Allbirds’ restaurant-like shoe store brings to mind French clothing brand Sezane’s foray into brick-and-mortar. Called “L’appartements”, the Paris and New York locations of the brand’s stores feature well-designed airy interiors and Instagram-worthy French-style cafes that offer free coffee and pastries. Shoppers are encouraged to sit, sip, and share, regardless of whether they purchase or not, since the “apartments” themselves are worth a visit. Attendees had the opportunity to compare their speed, movement production, and force production against those of pro athletes across three experience stations, resulting in full reports that they were keen to share across social media. A shareable experience done well translates into ROI. When people share their in-store experiences on social, it brings in their network and wins the brand more attention along with potential new customers. 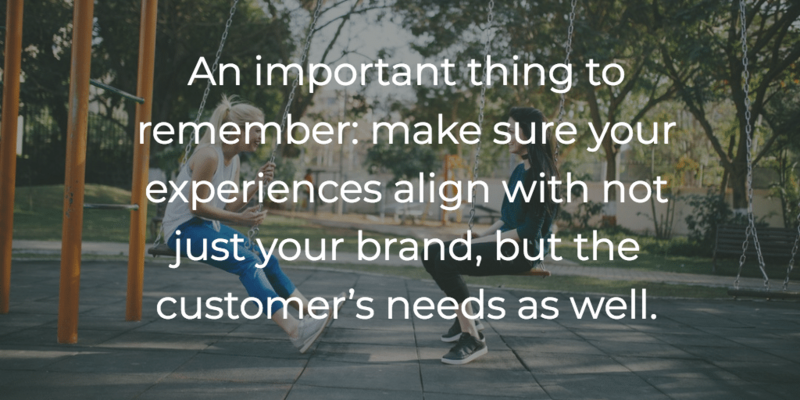 An important thing to remember: make sure your experiences align with not just your brand, but the customer’s needs as well. According to Advertising Week, media-saturated consumers are savvy enough to know when a brand is asking them to promote them on social media with nothing in return for the consumer. If done with only one-sided benefits, a shareable experience, no matter how unique, can actually damage the brand rather than enhance it. Sephora has an app that allows shoppers to virtually apply lipstick. Shoppers can use their phone cameras and use a digital filter to try out different brands and shades of color. IKEA provides shoppers with an augmented reality app that can preview what a piece of furniture looks like in their home. These innovations don’t just help shoppers make decisions. They create more conversion touch points for shoppers to evaluate and buy. Since so many shopper journeys switch between online and offline, mobile, AR and VR applications help bridge that gap in-store. Whether it’s investing in training the ground staff to be both emotionally intelligent and digitally-savvy, creating eye-catching and immersive in-store experiences, or using the latest VR technology to bring your products closer to your shoppers, or all three, a successful offline marketing strategy actually connects your shoppers’ journeys across all channels. The best thing about offline marketing done right is that rather than treat online and offline channels as competitive, it lets marketers see all channels as one customer experience.